Your home deserves the elegance and ambience of hardwood flooring. For competitive hardwood flooring prices and an extensive selection, turn to our locally owned and operated flooring store. Our showroom is filled with stunning choices – from numerous tree species to appearance to levels of grain and gloss. Ask our design and sales professionals to assist you in picking out the perfect planks for your home or business. Then, let us send a team of experts to your location for hardwood flooring installation. Our products and services come with our Ultimate Confidence Guarantee, which include the industry’s strongest warranties. We provide our customers with lifetime hardwood floor installation: If you experience any trouble with the installation, let us know and we take care of it at no cost to you. Installation errors really stand out with hardwood flooring. This flooring must lay flat and even and the placement of individual planks must offer a pleasing symmetry. This is required for beauty, as well as functionality. Any planks that are not flat and not secured to the subfloor are easy to damage. The installation specialists we assign to your flooring project bring with them the skill and equipment to do the job right. The process begins with delivery of hardwood to your home or business three days ahead of installation. This allows the wood to adjust to the level of moisture in your home. Before any planks are nailed down, the installation professionals tear out the old floor and clean and level the subfloor. Then, the planks are carefully placed and nailed to the subfloor. They leave a little bit of space at the outermost edges of the room so the wood has room to breathe. With skill and precision, they ensure the beauty and longevity of your hardwood floors. 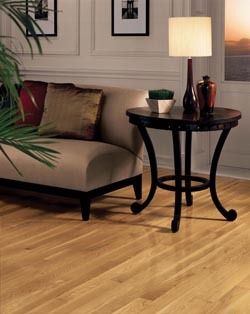 The grain and luster of the wood draw attention to the beauty of hardwood flooring. However, that is just one of the merits of this stunning flooring option. Hardwood is tough and long-lasting. It requires little in the way of cleaning and maintenance. Plus, it adds significantly to the value of your property. The benefits of this type of flooring are obvious. Once you have your heart set on hardwood, let our design and flooring professionals provide you with the facts you require to make an informed decision. Ask us to come to your home for a free consultation. We bring samples and let you compare oak to hickory to maple and acacia. This is the best way to see how the wood looks and feels in your home. For the classic appeal of real wood, select solid hardwood flooring for your home or place of business. Solid hardwood is milled from a piece of real wood from the species of your choice. Dense and thick, solid hardwood lasts for a lifetime as it can be sanded down and refinished after many years of wear. Stain the planks to look like the old flooring, but better, or choose a different shade for a whole new look. Contact us today for profession installation of your new hardwood floors. To find out more, call us at <PHONE> or use the form to the right. We proudly serve residential and commercial customers in Los Angeles and Inglewood, CA.